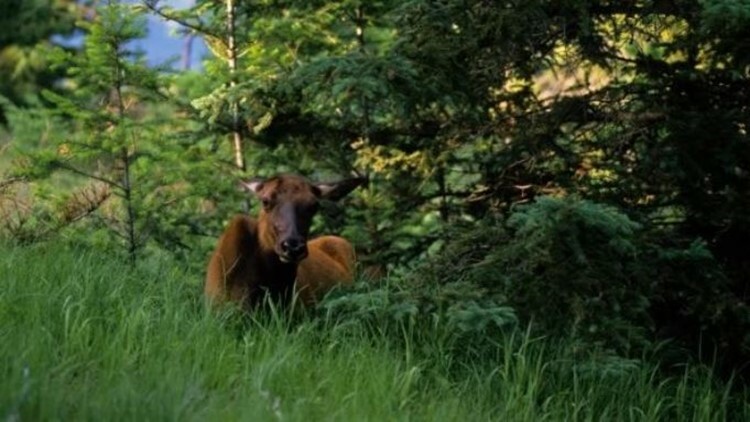 Officials say the elk was protecting its calf, which was bedded down a short distance away. YELLOWSTONE PARK -- A hotel employee in Yellowstone National Park was airlifted to an Idaho hospital after being attacked by an elk Sunday. The incident happened behind the Mammoth Hot Springs Hotel in the park. Yellowstone officials say the cow elk reared up and kicked the woman - identified as 51-year-old Charlene Triplett of Las Vegas - multiple times with its front legs. Triplett, who works at the hotel but was off-duty at the time, was hit in her head, torso and back. She was taken by air ambulance to the trauma center at Idaho Falls' Eastern Idaho Regional Medical Center. Officials determined the elk had been protecting a calf bedded down about 20 feet away, and hidden behind cars. It's not clear whether Triplett saw either the cow or calf elk before she was attacked. Rangers remained in the area to warn others about the elk and calf. No citations have been issued. Members of the public are urged to use caution and stay at least 25 feet away from elk, particularly during calving season.